The attorneys at our firm have the skill, experience and understanding of Education Law that is necessary when addressing such matters. As a trusted attorney, we will explain all legal matters surrounding your case and keep you informed as your case moves forward. We are highly experienced negotiators and litigators and will work tirelessly to defend every Client. Our lawyers can act as advocates for your rights and will advise you accordingly. Under Georgia law, Teachers have the right to a hearing before they can be suspended or terminated. As skilled Education Law attorneys, we understand how to address these matters for our clients. With our knowledge of the Fair Dismissal Act and various State Board decisions, we at The Teacher's Lawyer, LLC, can assist you in protecting your rights. 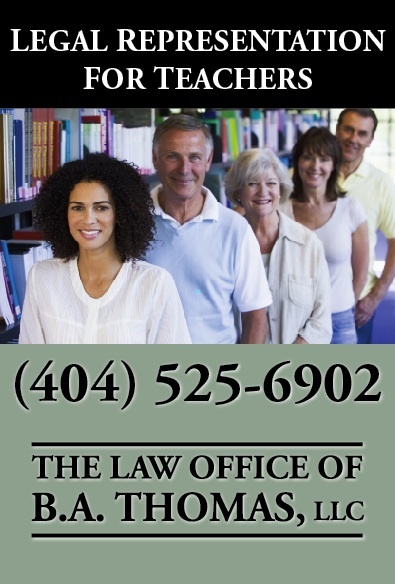 WHY CHOOSE THE TEACHER'S LAWYER, LLC? We have Extensive Education Law Experience. We Listen & We Care. We Return Your Phone Calls. We Aim to Exceed Client Expectations. Representation You Can Depend On. We have Litigated Against Every Major School District in GA.